Waterspouts and other tornado look-alikes may precede or follow tornadoes. But not always. Moving air has a tendency to spin - to form into a vortex. Large scale weather systems like cyclones, hurricanes, and even closed high pressure systems have some development ofspiralling winds to them, strong and destructive in the case of Hurricanes. On a smaller scale, Tornadoes have the fastest and most destructive winds of all, and they are discussed elsewhere.But there are several other members of the tornado family of fast rotating winds, usually not as destructive but still dangerous. Waterspouts are perhaps the most familiar, and when conditions are right they can be quite common. As their name implies they occur over larger bodies of water - lakes or stretches of sea - and have the typical funnel form of tornadoes. In fact some of them, the tornadic waterspouts, are tornadoes which either move over water from the land, or form over water. They are just as dangerous, form under a rotating storm or supercell, and like tornadoes are associated with a wall cloud. The other, more common forms are Fairweather waterspouts. They are less intense, and tend to form over warm bodies of water in association with rapidly growing cumulus clouds. These conditions occur frequently in the Florida Keys, a prime spot for waterspout observation. 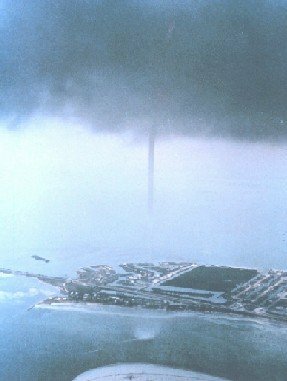 Much of our knowledge of waterspouts comes from studies by Dr Joseph Golden of NOAA in the 1960s and 1970s, and one of his photos is reproduced here. Often their development is associated with incoming colder air, - the waterspouts of the Great Lakes form this way when the water temperature is at its peak in late summer and early fall. Unlike tornadoes, fair weather waterspouts grow from the bottom up. The first sign of a waterspout is a dark spot on the water surface marking the beginning of a vortex. As rotation increases, spiral wind lanes extend outwards, and once wind speeds increase enough, water is whipped up to form a small cloud at the base. As the spout grows a funnel develops and extends upwards towards the cloud base. The waterspout is now at its peak, and has commenced moving across the surface, generally slowly but speeds up to 80mph (130kph) have been recorded. Wind speeds within the spout are typically between 60 and 120 mph (95-195kph), strong enough to be destructive but not devastating. The height of the column is generally less than 300ft (100m), but can reach heights of 2000ft or 600m. Fairweather waterspouts rarely exceed 100ft (30m) in diameter. Apart from the spray at its base, the funnel is not composed of water, but is outlined by water vapour formed as pressure drops and evaporative cooling occurs. The final stages of a waterspout occur as the column loses contact with the warm water and rising air that formed it. The column becomes ropy in appearance, and may bend. Rain, which is often falling behind the spout, will kill a waterspout by cooling the air around it, stopping convection and rotation. More information on waterspouts can be found among The Weather Doctor's entertaining and informative pages. As the name implies, landspouts are the land-based equivalent of waterspouts. They most commonly form under large, actively growing cumulus clouds or weak thunderstorms, but unlike tornadoes are not associated with a wall cloud or strongly rotating storms. They are usually defined by swirling dust, may have a weak condensation funnel reaching up to the cloud base, and can be quite destructive. This photo, courtesy of NOAA and the Krausman family, shows a probable landspout in East Wenatchee, Washington. Funnel clouds are closely related to genuine tornadoes and may develop into them. They form in a rotating storm system and are associated with a wall cloud, but often decay before a tornado is born. But once a dust cloud is visible below the funnel cloud, a tornado has, by definition, formed, as the dust cloud is clear evidence that the vortex associated with the funnel cloud has touched down. Cold air funnel clouds, probably more common in Canada, sit between landspouts and tornadoes. They are associated with cooler days when convective activity is not as strong, and occur with weak thunderstorms or growing cumulus clouds. Rotation in the cloud is less organised than in large rotating storms associated with most tornadoes, and the funnel usually doesn't touch down, when it would be classified as a weak tornado. Gustnadoes are strong, very local spinning winds associated with the gust front of a thunderstorm. They are not related to true tornadoes, and may occur well in front of the storm. They are marked by swirling dust or debris clouds, and can be destructive. And while some of them probably sneak through the reporting net as tornadoes, they have no true funnel and are not connected to the cloud base. 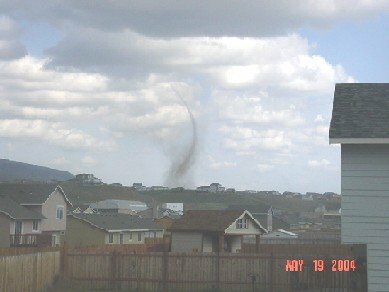 Dust Devils are rapidly rotating columns of air that form on fine hot days, generally over areas of fairly bare ground, including parking lots. They are not associated with thunderstorms. They form when the ground surface heats up, and a small disturbance to the overlying layer of hot air starts it rising and spinning. As velocity increases, the dust devil picks up dust and sand and carries it aloft in a small whirlwind. They often form in groups, are rarely more than 300ft (100m) high, and although wind speeds of about 70mph (110kph) have been recorded, they rarely cause any more than minor damage. As an aside, in Australia, where dust devils are called WIlly Willys, there lives a type of pink and grey cockatoo called a galah. These intelligent and apparently playful birds have been observed flying into willy willys, soaring upwards in the spiralling air, exiting at the top to glide down and do it all over again! In intense fires, strong updrafts over the firefront result in rapid vertical air movement accompanied by strong horizontal winds as air moves in to replace that in the updraft. In these conditions small intense whirlwinds, often outlined by bright flames, can form and move along the fire front. Similar heat related columns of rotating heated air may occur during volcanic eruptions. This little group of spinning columns of air, dust and/or water lack the huge destructive power of the larger tornadoes, but all can cause damage and injury. Those associated with tornado forming conditions are best avoided, but I do admit to a fondness for and fascination with waterspouts. I was fortunate enough to see two waterspouts at once, lit by sunshine with the dark storm clouds and rain curtain of an offshore storm behind them. It is an eery experience to see waterspouts at a distance - moving slowly, sometimes changing in form, but far enough away to result in a total absence of sound. I hope you have the chance to have a similar experience. Click on the appropriate link to find out more about Tornadoes, Thunderstorms, or to return to the Severe Weather Page. Back to the Top, or return to the Home page.